Spice up your dining room décor with this five-piece table and chairs set from the Atrium collection. The table features a heavy-duty 16-gauge steel base that is sleek and solid with a decorative crisscross pattern towards the top and shaped base stretcher towards the bottom. The round glass tabletop features a 1-inch beveled edge and brings style to any space that can be dressed up or down as you need. 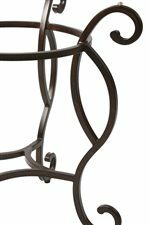 Also crafted from heavy duty 16-gauge steel, the four side chairs are built to withstand the tests of time. 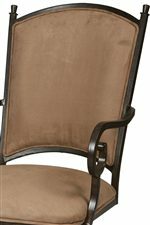 To keep you completely comfortable while you converse with friends and family, the side chairs offer upholstered cushion seats in Topanga Brown fabric. With a mixture of sleek and gently curved lines, plus an eye-catching crisscross weave pattern on the chair backs, you’re sure to love the fashion and function this five-piece set will bring to your home. Set yourself up with sophisticated style by introducing this leg table and chairs set to your dining area’s décor. The Atrium Five Piece Metal & Glass Table with Side Chairs Set by Pastel Minson at AHFA in the area. Product availability may vary. Contact us for the most current availability on this product. 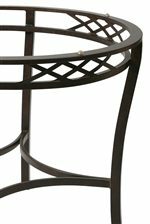 Case Detail This collection comes with a choice of a pedestal dining table base or a leg dining table base, both are constructed from metal. Description: Top Glass tops are made of 1/2" glass with 1" thick bevels. Wood tops feature solid hardwood construction and catalyzed finishes for durability, good looks, and protection against staining. Case Construction Heavy duty 16-gauge steel construction for durability.